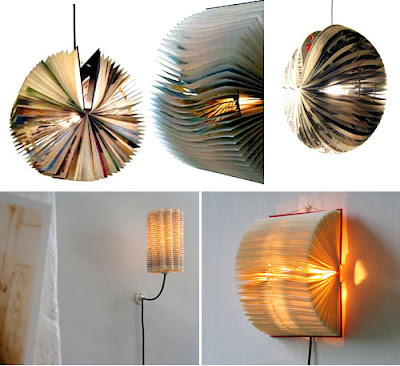 These lights are all made from old books and are available in various models. 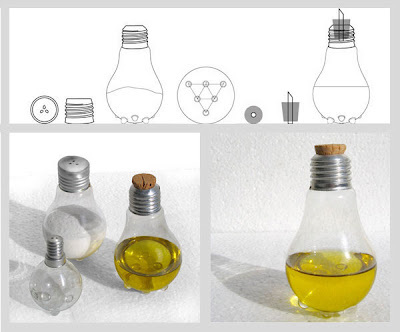 You can visit Atelier Bomdesign’s website for more information, and check out their other eco-design products. .
Liana Kabel trabaja con materiales tan diversos como tupperwares o agujas de punto. Se entiende que lo deberiamos hacer con material en desuso para que fuera verdadero reciclaje . 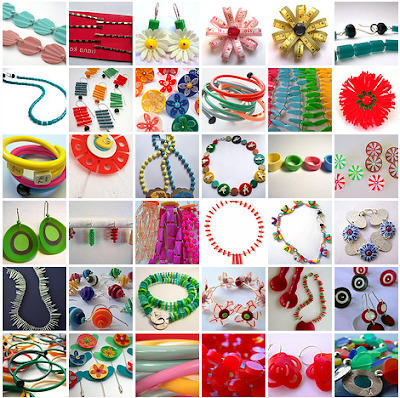 Liana Kabel works with so diverse materials as tupperwares or point needles. 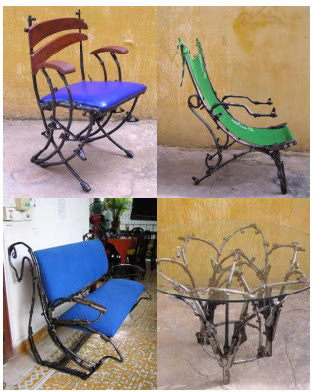 We understand that we should make it with material in disuse..
El Escultor Gabriel Wiese usa una estructura de acero y apila tapones de corcho creando muebles como los que veis..
Wiese dice que de esta manera el material guarda su propia historia. Sculptor Gabriel Wiese was becoming a cabinetmaker when he found and fell in love with his medium of choice-cork. 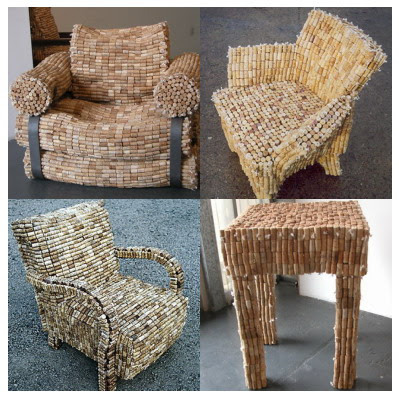 His furniture uses steel construction and support, and stacked corks from wine and champagne bottles. Wiese says, "this way the material keeps its own history, even while getting a new one through my creation". Michelle Brand siente pasión por las botellas de plástico. La base de las botellas es cortada y lijada para darle innumerables usos como vemos en las fotografías adjuntas . Michelle ve diseño donde la mayora parte de la gente ve basura. The root of my interests lies in sustainable waste management. At present it has manifested itself into a designer maker practice. I have designed an aesthetic and decorative fabric from which most people in the western world would perceive to be waste/rubbish. The fabric is composed of plastic drinks bottle bases, which have been cut, sanded and then tagged together. En Revolve se dedican a reciclar distintos tipos de "deshechos" que transforman en cosas útiles y luego las venden. 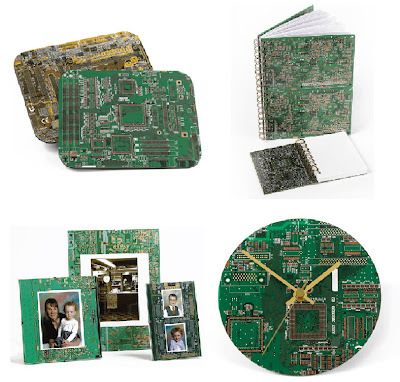 Es curioso ver transformada una placa base en fragmentos de una libreta, un reloj , un marco para fotos o un posavasos. También reciclan bolsas de plástico, cartones, yogures, ¡¡y hasta esos vasos de plástico blanco de las máquinas de café!! Our mission at Revolve is not to save the planet , but we do believe that we can make an environmental difference to the way people buy giftware and what they buy. We hope that through our products we are raising awareness of the escalating need for the three R's - Reduce, Reuse & Recycle. 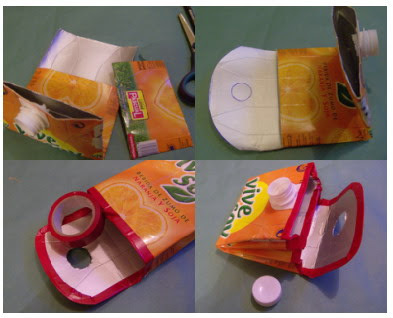 We also hope that through the use of great design, we can create a positive interest in the recycling process and encourage the end user to think about ways of recycling for themselves. Ptolemy Elrington rescata los carritos del supermercado que ensucian los ríos y canales, para crear estas esculturas de animales tan alucinantes. Hay artistas que ven materia prima donde otros solo vemos chatarra. 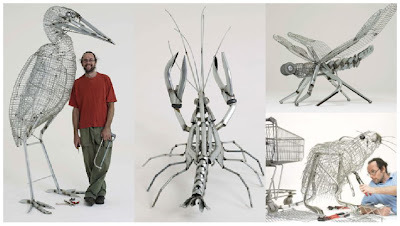 Ptolemy Elrington with his giant heron made from old supermarket trolleys pulled out from the river. The osprey is the perfect fisherman, using its feet and sharp eyesight to hunt. This metal version, however, should perhaps keep clear of open water. Giselle Morales es una artista y este fué su proyecto final de la Escola Llotja. Collar reciclado: plata, plástico, pan de oro, hilo de acero,lentes de contacto y lente óptico. Giselle Morales is an artist and this is her final project of Escola Llotja. 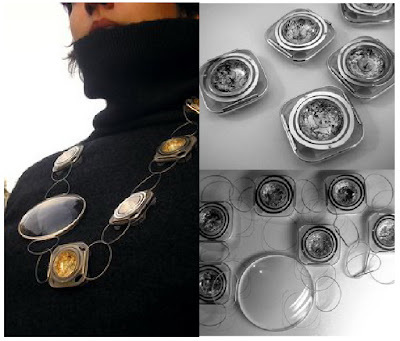 Recycled necklace: silver, plastic, gold, steel thread, contact len and optic lens. Aqui teneis las instrucciones completas. 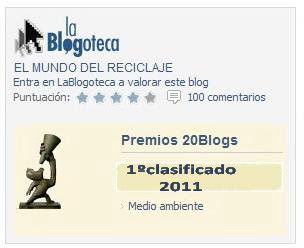 Si quereis ver mi propia versión aquí está en mi otro blog. Es parte de la campaña “ Barcelona Neta”. A mi personalmente no me gusta,creo que hay formas de utilizar la basura mucho mas estéticas. 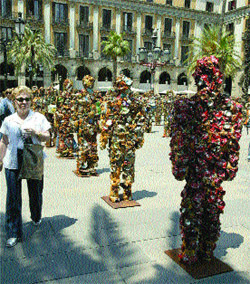 El artista alemán HA Schult (1939) lanza un vistoso mensaje ecológico y medioambiental a la ciudadanía con un ejército de hombres reciclados (trash people), que ha plantado en la Plaza Real de Barcelona.,desde ayer y hasta el 9 de junio. Después de más de 30 años de la guerra civil, terminando en 1998, el gobierno camboyano destruyó 125.000 armas en todo el país. En este tiempo Neil Wilford, especialista en armas junto con la unión europea, y el artista británico de Sasha Constable , vieron una oportunidad, y decididieron crear el proyecto Camboya (PAPC) del arte de la paz en noviembre de 2003. Esta es la manera más hermosa de conseguir transformar las armas en muebles y otros objetos. After more than 30 years of civil war, ending in 1998, the Cambodian gouvernment destroyed 125,000 weapons across the country.In this time Neil Wilford, a small arms specialist with the European Union, and British artist Sasha Constable, saw an opportunity, and decided to create The Peace Art Project Cambodia (PAPC) in November 2003. The Peace Art Project Cambodia was a sculpture project turning weapons into art as expressions of peace.In Cambodia this is the most beautiful way to get rid of weapons - transform them in furniture. ¿ Que se os ocurre hacer con una bombilla fundida? 2.- Retire los filamentos de la bombilla. 6.-Ahora usted tiene una salero o una aceitero en su mesa..
6.-Now you have a salt or oil container in your table..
Una artista japonesa que vive en Brooklyn, que crea obras de arte reciclando botellas de plástico. ¡Fascinante! 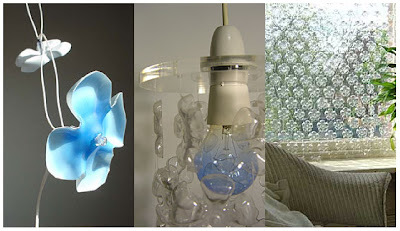 A Japanese artist living in Brooklyn, who creates beautiful and eco-friendly art by recycling plastic bottles. Quite fascinating !
" I love the idea of using liquid containers to make water animals. 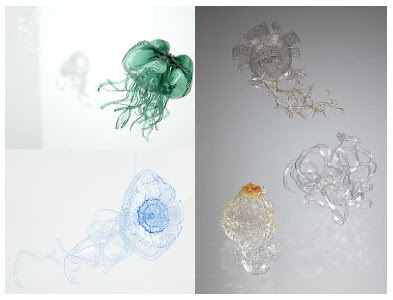 Contained/containing, trash/not-trash, like the jelly-fish or anemone: Living/non-living"